Matteo Guidicelli says he is happy Maja Salvador won at this year's Gawad Urian. Apart from being all set to start shooting the newest Precious Hearts Romance series with Jessy Mendiola this week, Matteo Guidicelli is also excited to show off his hosting skills in the new kiddie talent show Promil Pre-school’s i-Shine Talent Camp which premieres this Saturday, June 23. “Simula sa Happy Yipee Yehey! talagang natuwa ako sa hosting and I learned a lot from all the other hosts. So here naman I can show what I’ve learned and learn more and be with kids so masaya talaga. I love hosting. I really want to be a host so this is another venue for me to improve my hosting and to show my hosting but talagang blessed ako na pinili ako to be one of the hosts kasi dream come true ko to host and plus I love kids, I have a five-year old brother. Talagang close ako sa mga bata. It’s a dream come true talaga and it’s very fun to be with little kids,” he said. The talented actor is excited to work with the 12 kiddie finalists in the show. “It’s very nice to see them improve. It’s very, very exciting. It’s the coolest and newest talent show for kids. It’s an amazing show with kids from all over the Philippines,” said Matteo last June 19 at the i-Shine Talent Camp presscon inside the ABS-CBN compound. Matteo also shared how he felt after Maja Salvador’s Best Actress win at the recent Gawad Urian awards for the film Thelma. “Sobrang saya ko. I think she really, really deserved it. She worked so hard for it. She trained talaga as a runner and she gave her 110 percent and I’m very, very happy for her. I really congratulate her a lot. When I found out tumawag ako kaagad sa kanya kasi nasa Cebu ako nun eh, so ayun, sobrang saya ako para sa kanya,” he recalled. The 22-year-old actor said that Maja was overwhelmed by the award. “Kasi I know her emotions, she was shocked. Hindi siya nainiwala na tinawag na yung pangalan niya eh. So parang nabigla siya. I’m very, very proud of her,” he said. The hunky Cebuano also sported a tanned and leaner look during the i-Shine talent Camp presscon after successfully competing in a triathlon along with his dad. Matteo finished the Olympic distance category with a record of two hours and thirty minutes. “Gusto ko lang gumawa ng bagong look, bagong character. I’m very, very comfortable and most important is I feel better. I feel healthier. Hindi ko naman inisip yung pagpayat ko eh, inisip ko talaga yung training sa sports. Hindi na ako nag-re-racing, nag-triathlon na ako. Swim, bike and run. My dad won in his age group, 50 to 54,” he shared. As a host of the Kapamilya network’s newest kiddie talent show, Matteo shared what he hopes to impart to the kids. “[I can teach them how] to be a good boy (laughs), to be a sports man. We talk to them, we hang out with them all the time sa set. It’s very nice. When we go onset, mga thirty minutes naka-hug sila sa aming lahat so it’s very, very nice,” he said. 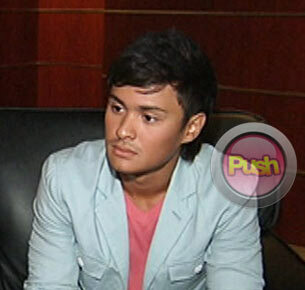 For more updates on Matteo Guidicelli, log on daily to Push.com.ph and follow @Push_Mina on Twitter.